If you could be, do or have anything you’d ever wanted, what would that look like? What would the body of your dreams involve? How would it look; how would it feel? And what would it be like to walk around in it every day, confident that now that you had it you were never going to let it go? Close your eyes for even a second and just imagine. Imagine you finally had that body you’ve always dreamed about and that on top of it you also worked in the perfect business or career of your dreams. What would that look like? What would have you waking up each day just thinking how lucky and excited you are to get to make a living and a difference by doing the thing you love? The thing that also allows you to get the most out of the other parts of life. Out of time with loved ones, time for travel and for trying and doing new things. Time to just be completely spontaneous, free. Time to just be you. What would the perfect dream life look like for you? What would it involve? What would your normal everyday life be like if it were absolutely and completely created by design? Perhaps you’re not sure how to answer that last question. Perhaps you can’t even quite answer any of the questions above, either because you haven’t allowed yourself to dream in such detail or simply because you haven’t thought about dreaming in such detail. Well – think about this. If you want to, if you decide right now that you’re determined no matter what, and if you have the right resources and support to help you, you can and will make your dreams come true. The dream body can be yours to walk around in each day. You can make a living and a difference doing something you love, without having to sacrifice 8+ hours a day to do so. And yes, you can also live a dream life where you get to experience, do and become things that most people would only dream about. 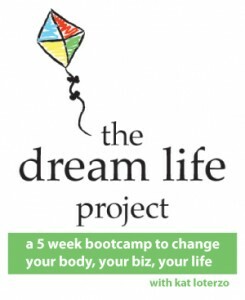 The Dream Life Project is my 5-week bootcamp that will give you all the tools, resources and support to change your body, your biz, and your life. With me at your side all you need to bring is the decision and determination to make a change. And in just 5 weeks you could be walking around in that dream body, underway in your dream business and waking up each morning realising that the dream life you’ve continually put off has, in fact, arrived. Today, for the first time, I’m revealing the step-by-step system I’m going to share in The Dream Life Project Bootcamp. And I’m SO excited to share this with you. Excited, exhilarated and just so darn happy for you as well, as I know how good this stuff is and what an incredible transformation it can make in your life in just 5 weeks. So with no further ado, here are the details of the exact systems and processes you’ll be learning, living and loving as you join me in the inaugural Dream Life Project Bootcamp, starting Monday July 16th! I’m also revealing some of the resources you’ll receive to use and keep forever along the way! In The Dream Life Project bootcamp I’ll teach you my step-by-step systems to creating the body, business and life of your dreams. Today, I want to reveal exactly what the ‘body’ system involves! Week 1: The Mindset Of Shaping Up For Life. I’ll teach you how to ‘flick the switch’ internally, so that you never again have to struggle for motivation; and never again have to start another diet! Week 2: Replace Don’t Erase. Learn how to replace your comfort foods and sabotaging habits with smart indulgences and behaviours – deprivation and sacrifice has NO place in creating the body of your dreams! This is the perfect week for dealing with emotional attachments to food and eating as well, something I will cover in detail and help you to break free of for life. Week 3: Nutrition Cycling For Lasting Fat Loss. Learn how to vary the way you eat and avoid dietary disaster by shocking your body. This is also the perfect recipe for avoiding nutrition boredom and covers the best ways to time treat foods so that they give you a metabolic advantage! Week 4: Creating Your Hassle Free Weekly Menu Plan. No more getting stuck for healthy food at home on the go, and definitely no fear of spending hours in the kitchen just to eat well. I don’t and nor should you! This week will give you peace of mind and a smart routine to guarantee you results as well as maximum enjoyment. Week 5: Stay On Track For Life. I’ll teach you the secrets of creating a lifestyle of great eating habits. This is about easy maintenance, staying on track, and about being practical, i.e. knowing how to quickly get back on track and back in shape if life happens! And don’t forget you actually get a FREE copy of my $57 Look Great Naked Eating Plan as just one of your bonuses when you jump on board with my Dream Life Project Bootcamp! Great to keep for yourself or as a gift if you already have your copy. Total minimum time commitment: 1.5-3.5 hours per week to get the body of your dreams, including meal preparation and food prep!Of course if you love extra motivation and support you may find yourself spending a little extra time in our private Dream Life Project Bootcamp Babes forum, or jumping onto one of my Q&A teleseminars! proof that my systems work! “Katrina Ruth has been the trainer who taught me how to lose 18kg (so far) in a safe and lasting way! Kat inspired me to be a better woman by saying “YES” to myself and putting ME at the top of my priority list. By following Kat’s advice, I felt I had all the tools to reach my dream of being a healthy, fit, and energetic mother rather than stay a tired, overweight excuse-maker! When I exercise, it’s as if I can hear Kat’s voice encouraging me to push through and work that bit harder to achieve more. When I’m planning or preparing meals, I think of Kat’s nutritional plan and how to make my meals Kat-approved! Now I’ve learned to listen to my body and can tell almost immediately when I’ve eaten something that doesn’t make me FEEL my best! Kat has been an amazing resource on my journey who is a wealth of knowledge on ways to help women achieve their dreams. Tomorrow I’ll be sharing my step-by-step system to create the business of your dreams. Everything we’ll be covering and implementing throughout the 5-week Dream Life Project Bootcamp. You can wait till then, or if you’re already completely pumped from what you’ve just read about getting your dream body, and if you know that now is the time to seriously commit to transforming your life then you can jump in feet first and grab your spot now. I believe that now is the time. That really, there is no other time aside from now in fact! So what are you waiting for? Join me. It’s going to be an awesome 5 weeks. And how darn fabulous are you going to feel walking around in your newly gorgeous and inspired body?! Good Fat: How Much Is Too Much?